Corn germ oil refinery equipments including steam generator, refining pot, decolorizing pot, deodorizing pot and other auxiliary equipments like hot water tank, bleaching earth tank, air compressor, pumps, filters, valves, electricity control cabinet, etc. 1. The stream gererator can gererate stream distillation. 2. 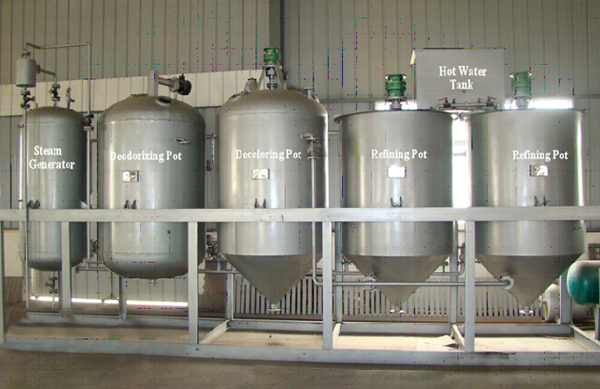 The neutralizing pot is used for acid for acid,alkali refining or rinse. 3. The decoloring pot is for bleaching grease. 4. The deodorizing pot is sued for deodotization tank. 5. 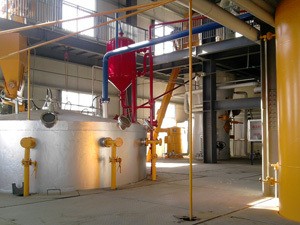 The conducting oil furnance provide the heating for production. 6. 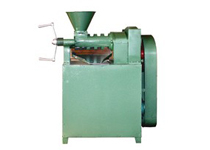 The vacuum pump provide vacumm for bleaching , deodorization which is can reach 755mmkg. 7. The air compressor can dry the bleached clay. 8. The air press is for filter clay. 9. The quality of die refined oil reached to the standards for edible oil and santitation by neutralization using phosphoric acid, water washing, bleaching. If you are interested in our corn gern oil refinery equipment or any other oil processing machine, please feel free to contact us in the following form, we are always at your service.